UML profile diagram example for Digital Imaging and Communications in Medicine (DICOM). 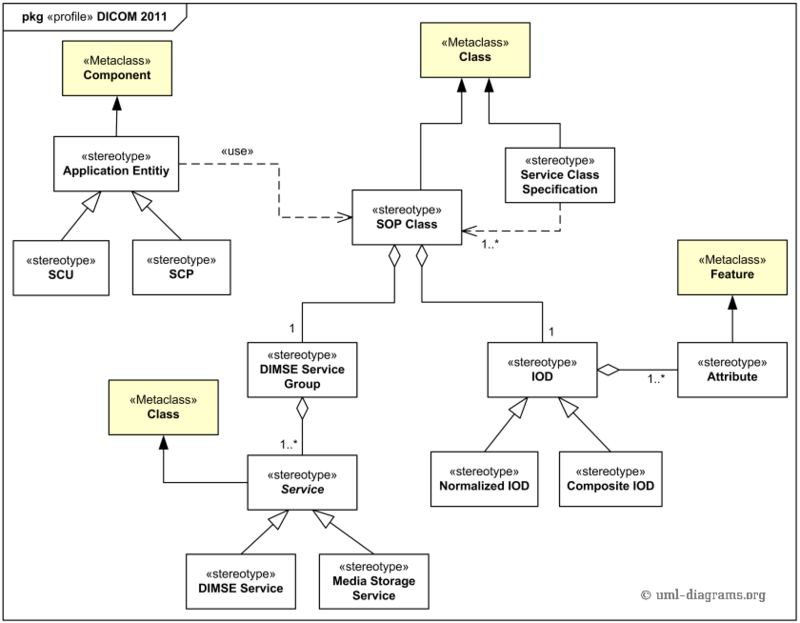 Here we show a simplified example of UML profile diagram for the 2011 version of Digital Imaging and Communications in Medicine (DICOM) Standard. The DICOM Standard published by the National Electrical Manufacturers Association (NEMA) facilitates interoperability of medical imaging equipment, promotes communication of digital image information, regardless of device manufacturer, alleviates the development and expansion of Picture Archiving and Communication Systems (PACS) that can also interface with other systems of hospital information, allows creation of diagnostic information databases that can be interrogated by a wide variety of devices distributed geographically. The DICOM Standard relies on several concepts developed in other standards. For example, Application Entity (AE) is defined in the seven layer Open Systems Interconnection (OSI) model (ISO/IEC 7498-1) as "an active element embodying a set of capabilities which is pertinent to OSI and which is defined for the Application Layer" (Layer 7). The Application layer is OSI layer that applications communicate with using applicaton level protocols to send or receive data across a network. A Service Class Specification defines a group of one or more SOP Classes related to a specific function which is to be accomplished by communicating Application Entities. A Service Class Specification also defines rules which allow implementations to state some pre-defined level of conformance to one or more SOP Classes. Applications may conform to SOP Classes as either a Service Class User (SCU) or Service Class Provider (SCP). Service Class User is the role played by a DICOM Application Entity (DIMSE-Service-User) which invokes operations and performs notifications on a specific Association. Service Class Provider is the role played by a DICOM Application Entity (DIMSE-Service-User) which performs operations and invokes notifications on a specific Association. DICOM Message Service Element (DIMSE) defines an Application Service Element (both the service and protocol) used by peer DICOM Application Entities for the purpose of exchanging medical images and related information. The DIMSE provides its services by relying on the DIMSE protocol. The DIMSE protocol defines the encoding rules necessary to construct Messages. A Message is composed of a Command Set followed by a conditional Data Set. A Service-Object Pair (SOP) Class is the union of a DIMSE Service Group and one related Information Object Definition (IOD) which completely defines a precise context for communication of operations on such an object or notifications about its state. The SOP Class definition contains the rules and semantics which may restrict the use of the services in the DIMSE Service Group or the Attributes of the IOD. A DIMSE Service Group specifies one or more operations/notifications which are applicable to an IOD. Information Object Definition is an abstraction of a real information entity (e.g., CT Image, Structured Report, etc.) which is acted upon by one or more DICOM Commands. An IOD does not represent a specific instance of a Real-World Object, but rather a class of Real- World Objects which share the same properties. A Normalized IOD is an Information Object Definition which generally represents a single entity in the DICOM Model of the Real-World. A Composite IOD is an Information Object Definition which represents parts of several entities in the DICOM Model of the Real-World. Such an IOD includes Attributes which are not inherent in the Real-World Object that the IOD represents but rather are inherent in related Real-World Objects. The Attributes of an IOD describe the properties of a Real-World Object Instance. Related Attributes are grouped into Modules which represents a higher level of semantics documented in the Module Specifications. This document describes UML versions up to UML 2.5 and is based on the corresponding OMG™ Unified Modeling Language™ (OMG UML®) specifications. UML diagrams were created in Microsoft® Visio® 2007-2016 using UML 2.x Visio Stencils. Lucidchart is a nice, free UML tool that I recommend for students. You can send your comments and suggestions to webmaster at webmaster@uml-diagrams.org.